Talking Mats has adopted day 69 of the justice for LB Campaign. This campaign was started was after Connor Sparrowhawk drowned in the bath whilst staying in an assessment treatment unit . In the words of his mum Connor was ‘a beautiful, hilarious and loved beyond words dude’. So, after decades of trying to improve services for people with learning disability, closing the long stay hospitals, bringing in person centred approaches, we are left in 2014 with huge inequalities in the health and life opportunities for people with learning disability and life’s like Connor are cut short in such a shocking, unnecessary and untimely manner. How many more tragic deaths are we going to see before residential services for people with learning disability are going to change? We need to see at the heart of service culture an ability to really listen , put the views of the patient at the heart of planning and see the families as key partners. Sometimes I think people see listening as a ‘soft issue’. Other things get measured but does the quality of listening ever get measured? It should because in my view it is a critical patient safety issue. Over the last few years I have had the privileged of working with a diverse group of people with a range of communication support needs. They have developed an interactive workbook for NHS Education Scotland. They share their experiences of contact with services to help staff understand how to improve communication and listening skills. They created 10 vision statements for staff of the things that were key to them. They told powerful personal stories to illustrate those statements. The stories illustrate both good and bad practice. You can download the free resource at http://goo.gl/QdOOev . Listening to people what strikes me time and time again is the lottery of service delivery. There are some great stories where people have received quality treatment and interaction but that is not universal for there are stories where you are left questioning the compassion and humanity of staff in so called ‘caring’ roles. The question for all of us is how we shift the culture so that we can all experience a person centred and listening health service. I hope the energy and impetus of #107 campaign ignites the flame of change so that ‘all dudes’ gets a safe and quality service. If you want to join the campaign then please follow @justiceforLB . This entry was posted in Adult protection, Blog, Learning disability, Personalisation and tagged Abuse, Learning Disability, Personalisation on May 27, 2014 by Lois Cameron. Talking Mats…….Is it suitable for Parents? 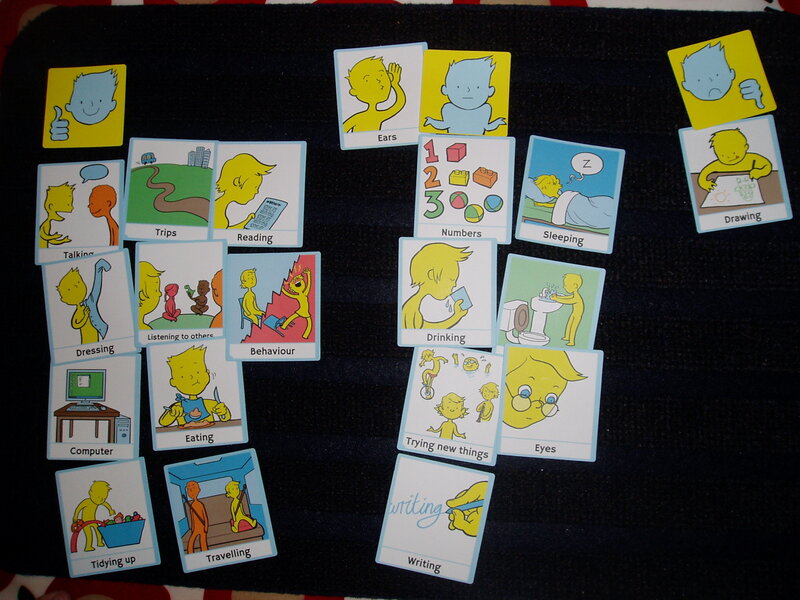 Many thanks to Lynne Baxter who has answered the question: Is Talking Mats suitable for parents to use? I have been asked to write an account of my experience, as a parent, of completing the on-line course available for Taking Mats. I completed this course in April this year 2014 and I am very proud of my achievement. First some background information. I am nobody special just a parent of a child who has a diagnosis of Autism Spectrum Disorder/Condition. My son is in a mainstream setting and has limited access to support and resources due to financial restrictions. Through time I realised that I was his main resource for support and really needed to improve my knowledge and understanding of this “hidden disability”. I had already heard about the wonderful resource that is Talking Mats, the tool that help makes communication easier for many. I started to do my research and find out more about it. I am not a professional who has been trained on the Autism Spectrum, my knowledge is only from my experience of having a child on the spectrum. I was unsure if I would be able to do this. After much consideration I took the decision to give it a try! I am so glad I did. While insuring that the product would be of benefit to my family, I nervously contacted the wonderful supportive team at Talking Mats and asked them what they thought. They were very encouraging and I felt empowered to try the training course! They assured me that they would help me as much as they could. This was very reassuring to know and gave me the reinforcement I was looking for. Every week I was given access to each module which I completed to the best of my ability. Anxiously waiting for the result and the feedback from the team to see if I was able to attempt the next module was normal for a Wednesday while doing this course. To my great relief the feedback was positive and before I knew it I was nearing the last assessment and the completion of the course. The last assessment involved me and my son using the resource Talking Mats, this had to be filmed and sent for grading! Once again I had to push myself out of my comfort zone! It will be worth it for the benefit the training would give to my family. A friend came and videoed the situation and it was sent off for feedback and grading. I passed! The feedback was amazing and now I can use the resource that will help my son explain his thoughts and feelings in a concrete way. The hardest thing for me was not to influence the results, I had to make sure it was his views and not mine! I have now registered to use the app and I am continually surprised by the evidence. I am delighted with the continued support from the team and I am very grateful to them for the resource. My son finds it hard to express his emotions, thoughts and feelings. This gives me hard evidence of his opinions and is great to have to reference too throughout the years! Having to use open questions has helped my son communicate more than he knows! A very good result! This entry was posted in App, Blog, Children and young people, Training and tagged App, Children, Talking Mats, Training, Young people on May 21, 2014 by Guest Blogger. I am a parent of a child in Primary one. We are expected to take our child along to the parent / teacher consultation meetings. After our first meeting I felt dissatisfied and no more informed. As a shy primary one, Eilidh gave no verbal feedback in the meeting, I felt I couldn’t voice any real concerns I had in case I knocked Eilidh’s confidence and the teacher was probably in a similar situation. Instead everyone was very nice but I left without any plan of action and no feeling that Eilidh’s teacher knew how she was feeling about her progress at school. This time, I plan to be more prepared and to make sure Eilidh is properly at the heart of the consultation. I decided this time to use the new ‘Consulting Children and Young People’ pack, and felt the ‘my body and skills’ section was ideal for thinking about the key aspects of school life. Eilidh engaged immediately with the mat and seemed confident with what the symbols represented. By the end of the mat and after going over it with her and checking if there was anything we had missed, I feel we have a really good starting point for discussion when we attend the meeting on Thursday. Eilidh is most concerned about her drawing skills. Her face dropped when she saw the card. She perked up a little when she looked at the symbol as she decided she was good at drawing sunshine but not people. On discussion it turned out she really wants to be able to draw clothes on people. We talked about what we could do and decided she could do drawing practice with her dad (who is much better than me!). She was happy with this and has since already drawn a fully clothed person! She is a bit unsure about numbers, writing and trying new things. These are things to discuss with the teacher but it shows her awareness of where she needs more support. Going to the toilet and drinking water both require her to ask the teacher for permission and she put those in the middle as she doesn’t always like to ask and often comes home with a full water bottle. This is something we can bring up and hopefully the teacher can reassure Eilidh it is fine to ask. Finally, we were able to finish on a high as we acknowledged that she has really increased her confidence in talking (at school), reading and getting dressed independently. Again it really shows how aware she is of her own abilities and what she has struggled with in the past. This entry was posted in Blog, Children and young people, GIRFEC, Participation and tagged Children, GIRFEC, Participation, Talking Mats on May 13, 2014 by Margo Mackay. Teens are comfortable using communication tools in the form of social media. They can feel less comfortable with direct communication and often find it hard to put their feelings into words. 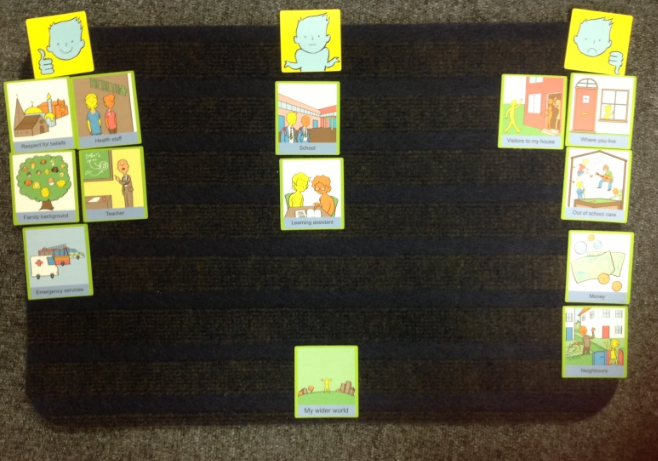 Using a Talking Mat when talking to teenagers provides a communication tool which takes the focus off face to face interaction. It gives a thinking space to help them to express their feelings. It also allows you to have a balanced conversation because it talks about the positive things in daily life as well as the opportunity to talk about difficult things. Tina is a 13 year old girl who initially had coped well with the transition to High School but in February had started to refuse to come to school. She was unable to explain what the problem was and when asked about the reason for her absence, would say “ I hate school”. The “Consulting children and Young people -secondary resource” was used to consult with Tina. She was presented with some of the options from “My body and Skills” to think about how she was feeling. Tina used the top scale Happy(Things are going well and Not happy (things are not going well). During the Talking Mats interview she opened up about how she felt about travelling to school (she hated going on the school bus and felt embarrassed) She clearly identified the fact that she has specific learning needs as she has difficulty understanding and concentrating in class and often falls behind with her written work. Attending her maths class was particularly difficult and she did her best to avoid going. She also talked about her difficulty with talking to adults and also to her peers. Often she feels excluded in conversations as although she is listening, she doesn’t always understand what they are discussing and doesn’t know what to say. She has a problem with sleeping and feels her mood is low a lot of the time. She also commented that she can feel extremely angry and this has a negative effect on her behaviour. On the positive side, she loves to read and feels happy about her diet and her weight. Helping Tina to grade her feelings about specific issues helped to identify what needed to be done in the first instance to get her back to school. Alternative travel arrangements were put in place, extra support provided for her in class and from the learning support base. She is attending school again and the pupil support team are gathering together the appropriate “team around the child” to explore her difficulties further. 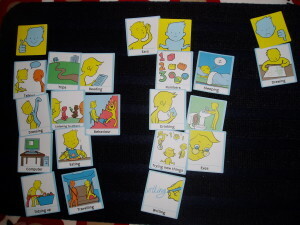 Find out more about how to use Talking Mats by signing up for a training course at Talking Mats. The communities where children grow up can have a significant impact on the well-being of both children and families. The Consulting Children and Young people pack contains the topic “My Wider World”. This topic allows exploration of the impact of both school and life out of school as well as the support systems available to them. The World Health Organisation reminds us of the importance of gathering environmental information from children. As a child develops the environments of their everyday life are closely connected to home and school and finding out how the child feels will give insight into their independence and activity. Negative environmental factors often have a greater impact on children than on adults. In order to promote a child’s well-being, effort needs to be given to enhancing a child’s physical environment as well as their social or psychological environment. Daniel is an 11 year old boy with a diagnosis of Asperger’s Syndrome. He completed a Talking Mat to explore the impact of his environment on his condition. He was asked to grade his responses using the top scale Happy (Things are going well) and Not happy (things are not going well). He immediately commented about how he felt about school (“yeah –it’s okay”) He expressed a strongly negative reaction when asked about where he lived. He was very unhappy about the location of his house as it is in an extremely remote location and he can never have any friends round to play. He never gets visitors to his house apart from an uncle that may drop by. He feels bad that he doesn’t have any neighbours and would love to live somewhere that has got other houses nearby. He has talked to his mum about it but she says, “she can’t take me places – too much petrol” He knows that his mum is worried about money. He also really dislikes “out of school care” as he is rarely allowed to play on the computer. He is happy with his teacher, support from health services and the emergency services. Daniel was clearly upset about his lack of social integration and contact with his wider community. Environmental support included supporting the care-givers in the “out of school club” by providing training and advice about Asperger’s Syndrome. Social work became involved to help to help locate local youth groups and finance. This entry was posted in Blog, Children and young people, Communication difficulties, GIRFEC, Learning disability, Participation and tagged Children, Communication difficulties, GIRFEC, Participation, Young people on May 5, 2014 by Margo Mackay.